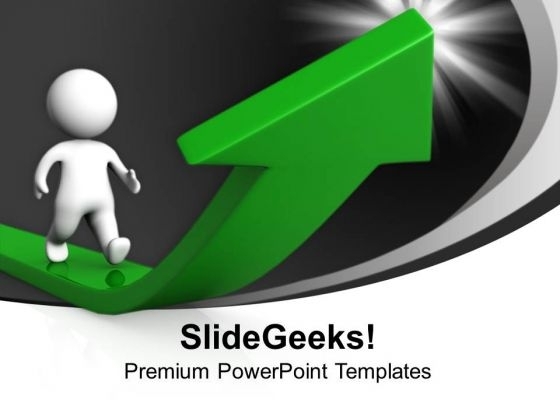 Deliver amazing Presentations with our above template consisting an image of 3d man walking on green arrow moving upwards. This image has been professionally designed to emphasize the concept of business growth and success. It is a useful captivating tool concieved to enable you to define your message in your Business Leadership PPT presentations goals and targets, business development and finance. Our PPT images are so perfectly designed that it reveals the very basis of our PPT template to make your clients understand. Equalize the equation with our 3d Man Walking On Growth Arrow Success PowerPoint Templates And PowerPoint Themes 1012. Get the audience on board with you. Bring all different factions together for you. Our 3d Man Walking On Growth Arrow Success PowerPoint Templates And PowerPoint Themes 1012 champion camaraderie.